Lia Halloran is an artist who grew up surfing and skateboarding in the Bay Area and developed a love of science during high school in her first job at the Exploratorium in San Francisco, doing cow eye dissections and laser demonstrations. Her studio practice has been in dialogue with interactions science and nature for the past fifteen years and is the primary mediator between subject matter. Halloran’s work often makes use of scientific concepts as a starting points to produce merged projects that have included astrophysics, magnetism, perception, scale, gravity, giant caves of crystals and ice, cabinets of curiosities, taxonomy, classification, periodic table of elements, skateboarding, and interconnections within the above. Halloran has participated in several interdisciplinary projects with scientists, artists, and architects including Pioneer Works Director of Science, Janna Levin. Halloran is currently working on a book with physicist Kip Thorne about the warped side of the universe with Kip’s poetry and her paintings. 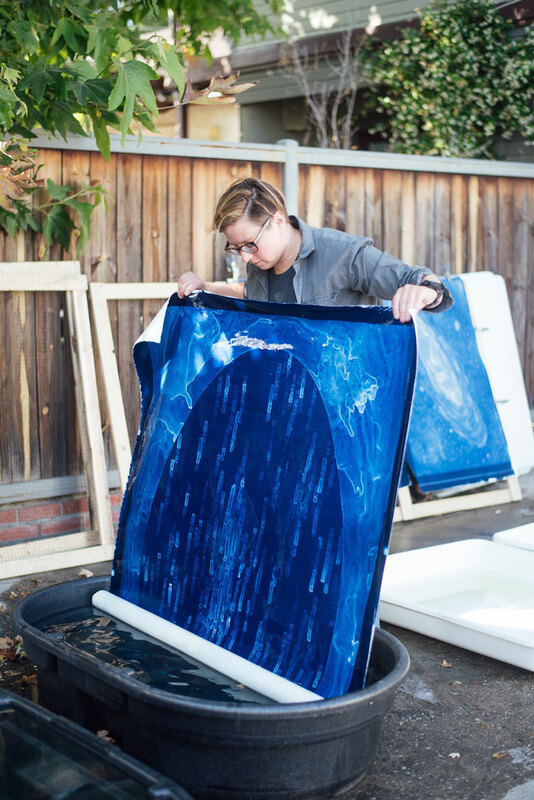 In 2016 Halloran was awarded an Art Works Grant from the National Endowment for the Arts for the project Your Body is a Space that Sees, which draws from historical materials and archives to recreate an astronomical catalog of large scale cyanotypes based on discoveries made by women in the late 1800’s. Lia Halloran received her BFA from UCLA, an MFA from Yale University and she serves as an Assistant Professor at Chapman University. Her recent exhibition Deep Sky Companion comprising of 120 works expanding through four stories is on view through December 2016 at the Cahill Center for Astronomy and Astrophysics at Caltech in sunny southern California.